Cheers HRM. Looking for a larger tank for poor Steve, my kid's ever growing Koi. He summers out in the pond where he gorges himself on whatever floats by. By the looks of it, he must have dined on cats, beach balls, and the occasional male moose, as he seems to have tripled in size over the last year. Anyway,every winter Steve migrates South, floating on the fall winds which carry him to his aquarium which is tucked safely somewhere in my kitchen. The problem is that this year he seems to be wearing the fish tank rather than swimming in it. While I guess the damn thing could have shrunk, I suspect that it's Steve's high protein diet that has caused all this inconvenience. My first thought was to put him on an all grapefruit diet or maybe sign him up for weight watchers, but he won't even discuss it. 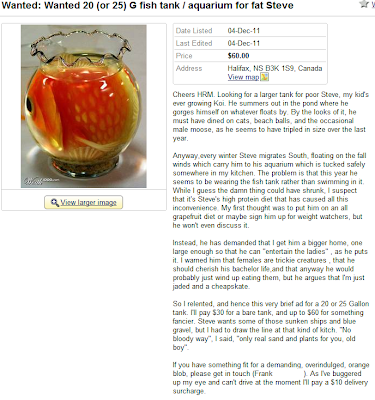 Instead, he has demanded that I get him a bigger home, one large enough so that he can "entertain the ladies" , as he puts it. I warned him that females are trickie creatures , that he should cherish his bachelor life,and that anyway he would probably just wind up eating them, but he argues that I'm just jaded and a cheapskate. So I relented, and hence this very brief ad for a 20 or 25 Gallon tank. I'll pay $30 for a bare tank, and up to $60 for something fancier. Steve wants some of those sunken ships and blue gravel, but I had to draw the line at that kind of kitch. "No bloody way", I said, "only real sand and plants for you, old boy". If you have something fit for a demanding, overindulged, orange blob, please get in touch (Frank 4xx xxxx). As I've buggered up my eye and can't drive at the moment I'll pay a $10 delivery surcharge.